Let’s face it there are abundant choices in the market today for kitchen and bath cabinetry. But which one is right for you? Stock cabinetry has proven to solve many remodel and new construction issues over time. Stock cabinets will offer popular door style – specie – finish combinations to fulfill current market demands. This type also will build and ship relatively quickly, in many cases, even if less common sizes need to be ordered are available in two weeks or less. Many popular SKU’s may actually be held in distribution inventory, making the waiting period even shorter. Stock cabinets are convenient for apartment renovation, basic new home construction, in-law or second kitchens, and property flips. Quality of construction will vary here; joinery will tend to be most basic to maintain production goals and schedules at manufacturers. Semi-Custom cabinetry covers the vast majority of the entire cabinetry market, and should actually be broken into two segments. Entry level cabinets in this group will be similar to stock cabinet offerings. More door styles and stain selections will appear. Modifications to cabinets at this level are available, but tend to be limited. Customers considering entry level Semi-Custom may be in this market for its fairly rapid build and ship lead times, and budget cost versus higher end Semi-Custom lines. The next step up the ladder can bring a designer and consumer to brands of cabinetry that are virtually “custom”. Dimensional changes are usually authentic; the selection of door styles and finishes expands greatly. Plywood is predominantly used versus furniture board in constructing these cabinets. Customers interested in these cabinetry offerings are typically investing in their kitchen and bath spaces and desire the utmost in space usage and functionality. It’s possible that you already started to shop around and contacted a few companies, and requested a few quotes for both the cost of cabinets & countertops and the cost of installation. Asking the right questions is important to ensure that your job is not only efficient, but the design is exactly what you requested in the first place. Below, we put together a list of FAQs that will help you navigate creating the kitchen of your dreams. We want our clients to be as well-informed as possible to make the buying and installation experience as positive as can be. There are many factors that must be considered when figuring out the cost to remodel a kitchen. These factors include, the size of the kitchen, the type of cabinets you choose, if you choose to install new kitchen appliance, etc. Since figuring out the total investment takes some planning, we encourage you to sit down with one of our kitchen specialists and identify the types of materials and items you would like to have in your new kitchen. This will help us determine your budget and from there you can pick and choose the pieces to complete your kitchen. 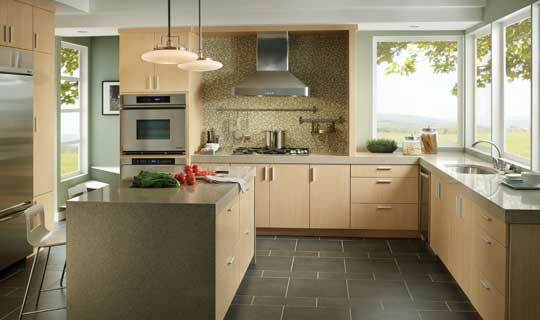 There are generally three types of kitchen cabinets available: custom, semi-custom and stock. How do I choose which cabinet type is right for my kitchen? Custom Cabinets- are made to order cabinets. Custom cabinets are perfect for large or non-standard kitchens; they can be created to fit in just about any size kitchen or configuration. While custom cabinets are generally more expensive than pre-fabricated stock cabinets, for those that would like their kitchen to be unique- custom is the only way to go. Besides design choices, those that choose custom cabinets can ensure cabinets are made to the highest quality standards. It should be noted that not all custom cabinets come with door styles- so it is necessary for you to also choose door styles (they will custom match a stain for you) and the features you would like most. Semi- Custom cabinets are the most popular style of kitchen cabinets sold today. The main difference between semi-custom and custom cabinets is that semi-customs allow minor modifications to the cabinets such as installation of glass and modifying the size. It should be noted that semi-custom cabinets offer a wide range of styles, cabinet finishes and door styles. Stock Cabinets offer the least amount of modifications and are crafted to fit in most kitchens. However, don’t let the name fool you, our stock cabinets offer a wide range of features and are excellent quality. For those looking for a great value, with solid construction, stock cabinets make a great choice. It all depends on the type of cabinet that you choose. A typical stock cabinet can take a couple of weeks to eight to twelve weeks for delivery. You should also plan for one to two weeks of installation. Semi- Custom and Custom cabinets can vary as well depending on the choice of style, size of kitchen and other factors. In addition, the type of countertop you choose can also impact the time it takes for a project to be completed. Generally laminate countertops take about a week, where granite can take a little longer. Sure, contact us today and we will be more than happy to put you in touch with other homeowners that went through the process of installing beautiful kitchen cabinets or granite countertops in the San Antonio area. We’ve been doing business in the community for over 30 years, so we are proud of the many homeowners that chose us to transform their kitchen. As always, feel free to contact us with any questions you may have. We are skilled craftsmen who are involved directly in you kitchen cabinet and granite transformation from bid to install. To get the answers you deserve, call us today and schedule a free in-home consultation.